Dreaming: Fire, water, watiya, wanu. Macromedia Flash Player is required. These paintings depict an aerial view of the country, representing the lay of the land as created by ancestral beings during their journeys of creation. 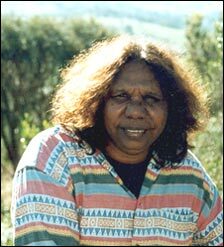 These ancestors are often a combination of animal-like creatures with human characteristics and frailties, and it is their adventures which have served to shape the landscape, while at the same time establishing the laws under which the Aboriginal societies operate. A typical and common story for example, is one of the taboo of any relationship between a man and his mother-in-law (or any woman who comes from the ‘skin’ group from where a mother-in-law is drawn). Any such relationship is followed by dire consequences in these ancient stories, and therefore to this day, it is forbidden for a man and his mother-in-law to communicate in any way whatsoever.